Looking for a stunning getaway? It's time for Rann Utsav — a carnival in The Great Rann Of Kutch. 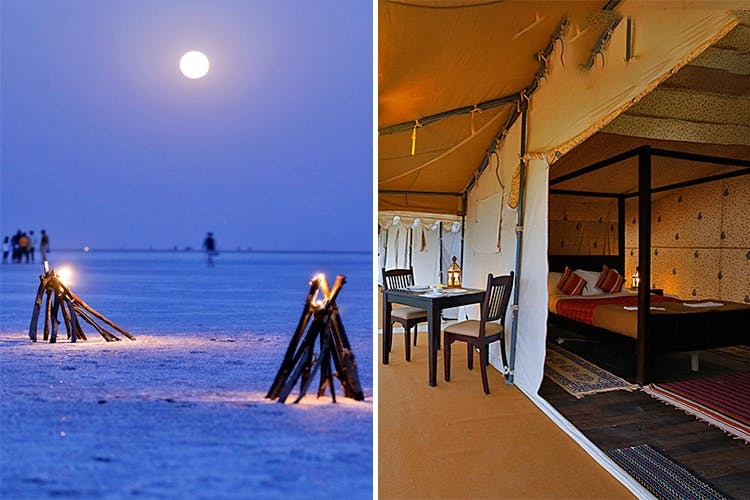 The white sand desert near Bhuj — Dhordo (also known as the Tent City) is decked up from November to mid-February for this utsav which brings together Gujarati traditions & culture, art, food under the tent (Yup, literally). Expect soul-stirring music, memorable sunsets, adventure activities, and if you're there on a full moon night, what a moment it shall be! Festive, boisterous, and vibrant — you're signing up for a once-in-a-lifetime holiday. INR 12,980 that sorts your stay, meals, to and fro pick & drop from Bhuj. Your trip starts at Bhuj.